Well it all started with Janet, a school-friend whose birthday was last Sunday. I had promised to bring a cake and not being a fabulous baker I of course turned to the professionals. 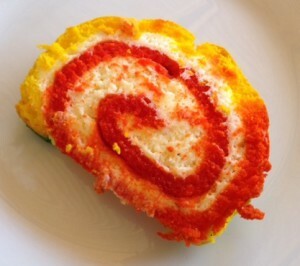 And now I realize that it all started even before this, as I had been to lunch with a friend, Bart, the week before and he had produced the most un-Swiss Swiss roll cake you could ever imagine. Here rainbow nation, met gay pride, met paint by numbers, met Indian delight, met plastic Chinese toy. So off I went with more friends, David and Gordon … a lot of different friends are getting involved in this story – to Saleh’s bakery in Church Street Mayfair to buy said cake. It certainly did not disappoint as it too was the talking point of Janet’s birthday party for some time. ‘How do they get the inside colours different from the outside colours’ ?? Yellow becomes red, blue becomes purple … the sheer joy and delight of garish kitsch! 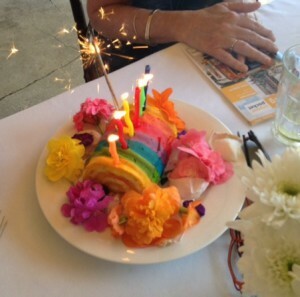 It’s sweet and cake-ish but that’s what one would expect from a fabulous creation like this. While at Saleh’s bakery we decided to duck into Shayonas’ diagonally across the road at 74 Church St (Saleh’s is at no 81) for some take away vegetarian curries. They sell their takeaways by size (i.e. small, medium and large containers). And even with small containers, I came away with far too much – saying ‘no’ and making choices are not my strongest suits. So I left with a to-die-for brinjal curry, a mung dahl, mixed veg, potato curry and spiced roti. For at least 2 meals it came to just over R70. That’s hard to beat. And it was really delicious. Certainly on my menu when I next have people for supper. 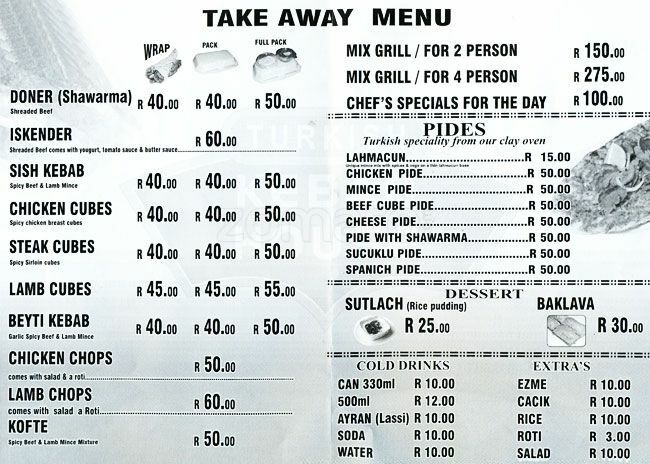 And then while there was all this scurrying and excitement between curries and cakes, David realized that Turkish clients of his had recommended Burhan’s Butchery and Kebab House as an excellent Turkish restaurant in Joburg – and it turns out to be right next door to Saleh’s bakery. So off we went a few nights later for supper. Don’t expect atmosphere and glamour but expect huge portions at very cheap prices. We (4 of us .. yes another friend Viv joined) arrived early – around 6.45 (they say the kitchen closes at 8). Be warned – portions are BIG! We were all quite peckish so ordered a platter of 3 Lahmacun to share as a starter – not really knowing what to expect. For R45 we thought it would be a small portion. At the same time we ordered the chef’s platter as a main course, also for the table. Next thing our little appetizer arrived comprising 3 medium size Turkish flat bread (like pizzas) with the most delicious spicy meat topping, along with a fabulous yoghurt, cucumber, mint and dill sauce and a mild spicy tomato sauce. Plus a large salad. This was enough for a meal in itself. Our faces must have been a picture when our chef’s platter arrived with at least 6 more large Turkish flat breads as well as a portion for each of us of chicken cubes, kofte, lamb chops, shawarma, steak cubes and, the most delicious thing of all, chicken chops (which we initially thought sounded a little alarming). They manage to get the chicken into a chop shape using thighs and I think pieces off the drumstick which are subtly spiced, cooked over an open flame and are incredibly succulent. Those chicken chops alone are what we would all go back for. And the whole meal with drinks (sadly no alcohol) cost us each R100! Also hard to beat. We didn’t even have room for the baklava … next time we’ll know not to order so excessively. Burhan’s also do a big business in take-aways – served through a window directly to patrons standing on the pavement. We thought next time we’d try Al Hamra further along Church St but we will certainly be back to Burhan’s for their chicken chops. Please email me more cake!!!!! And Mayfair sounds a MUST. Nearby Fordsburg also has lots of interesting Indian style restaurants and also in Church St there’s an Ethiopian restaurant. Next time you are in Joburg I will make sure that I have time to do some fun exploring of new places. Shayona’s and Burhan’s definitely on my top list. And if you loved Burhan’s, Istanbul (52 Central St) in Fordsburg is definitely worth trying out. Go on a weekend evening if you are looking for atmosphere as it’s a block away from the night market. Al hama has the best food. Try the chicken oriental, tandoori chicken mild, fried rice, aloo (potatoes) roti, sizzlers. The menu so vast and delicious. Thanks so much Ruby. Will certainly have that on my list although seems from other comments that everything there is delicious! YUM!!! I’m there! can’t wait – thanks Fatima for the thumbs up and suggestions. Thanks Laurice. Just had a great lunch at Little Addis in Maboneng with Barbara. Really great meal and amazing value. 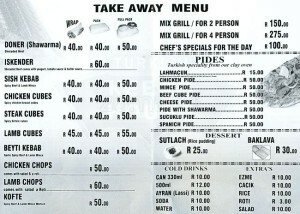 My husband is Turkish and we often drive through to Burhan’s, all the way from Pretoria East. I highly recommend the Iskender Kebab. It is the first meal I order whenever we travel to Istanbul and the only thing I order at Burhan’s.